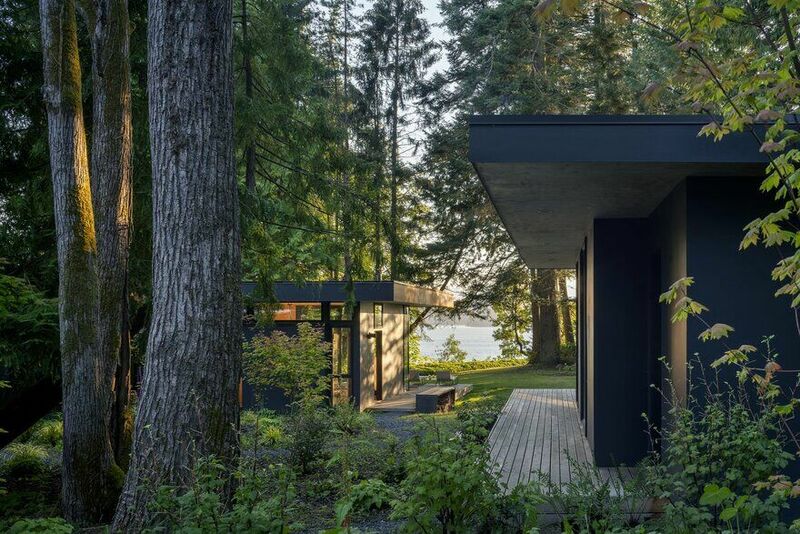 A series of  family cabins hidden in the forest and overlooking Washington’s Hood Canal, the Hood Cliff Retreat is located on a 1.13 acre site atop a bluff on a wooded site on the western shore of Hood Canal in the Pacific Northwest. 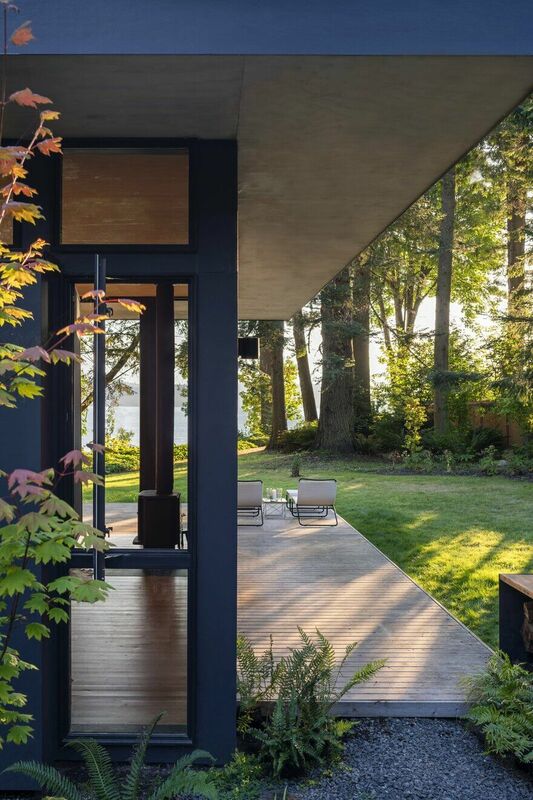 “As avid bird watchers and naturalists, the clients wanted an indoor outdoor family retreat that would immerse them in the stillness of the forest and capture the delicate Washington sunlight and views toward Hood Canal and the Olympic Mountains to the west,” says architect Matt Wittman. 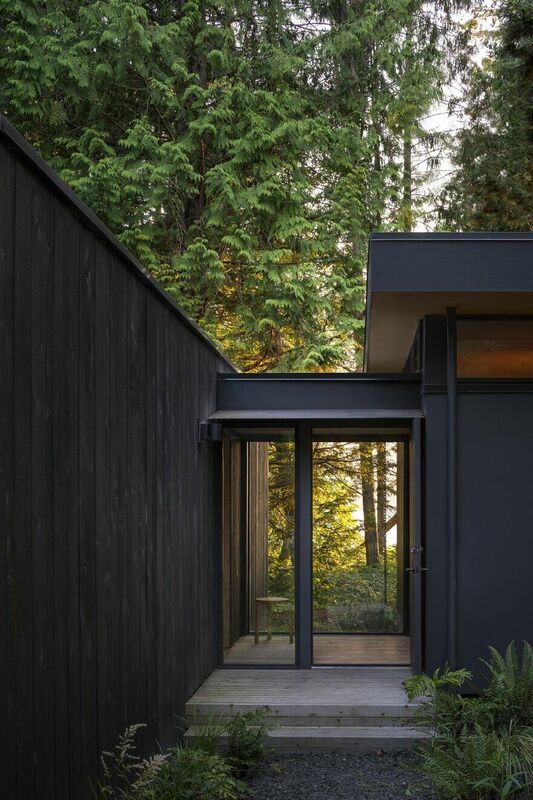 Built on the site in 1962, the original dark and opaque cedar cabin left the owners feeling cut off from nature, and they asked for a indoor outdoor retreat that would allow them to be closer to the land and also house an expanded program of three additional bedrooms and sleeping quarters for their extended family. The Hood Cliff Retreat has three elements: 1) The repurposed 20’x20’ footprint of the original cabin, 2) the cabin addition, and 3) a new bunkhouse and bathroom to the north. The clients include owner, Pat Troth, who had a career in hydrology and forestry and had a deep love for trees, soils, and the richness of the natural world. Her husband, John Troth, is a wildlife photographer who travels internationally to capture images of birds and other animals in their native habitats. Their grown children work as natural resource scientists and spend much of their time deeply engaged with the outdoors. With John and Pat living in Indiana, their son John in Toronto, and Ashley in North Carolina, the family yearned for a place to draw them together in one place. The vision was a retreat where the family could be together and celebrate their passion for being outdoors and connect with the native flora and fauna of Hood Canal. 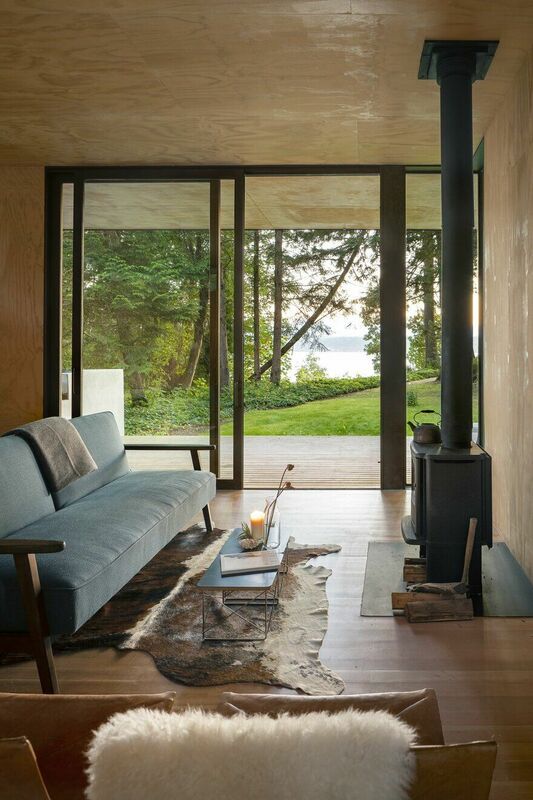 The clients wanted a retreat where they could watch birds and take in the nature of the Hood Canal. While they loved modern architecture, they did not want a building that was overly expressive of itself. They asked for a set of simple structures that would allow them to be close to the land. This resonated with Wittman, who had an appreciation for the simple vernacular structures of his rural childhood on a ranch in northern Idaho, and designs buildings allowing people to “experience the beauty of nature through architecture.” The Troth family sought a place where their friends and family could gather together while also experiencing a moment of solitude and reflection. 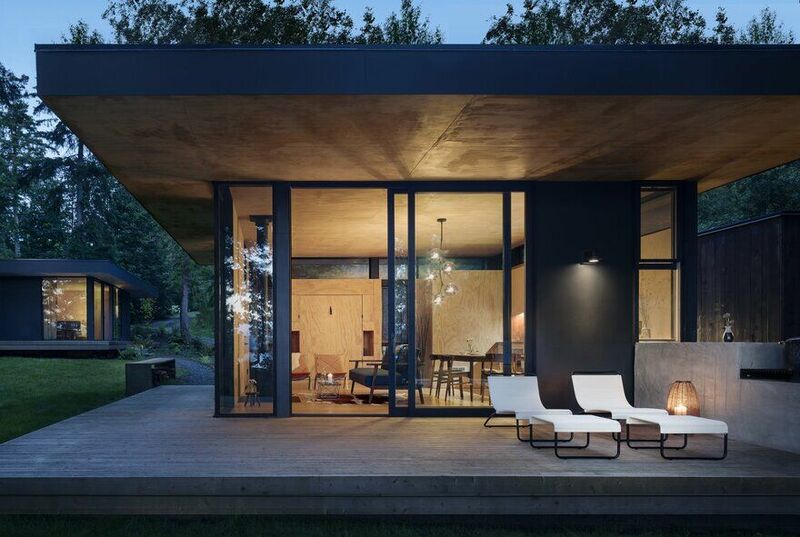 The three single story volumes with large glass openings, sliding doors, and continuous decks allow for such gathering and reflection. The architecture defers to the landscape – inspired by nature and in particular the native killdeer bird. “Unlike most birds, the killdeer doesn’t bring outside vegetation to build its nest – it pulls away the existing brush, burrowing into the existing forest, and nesting on the ground,” says Wittman. 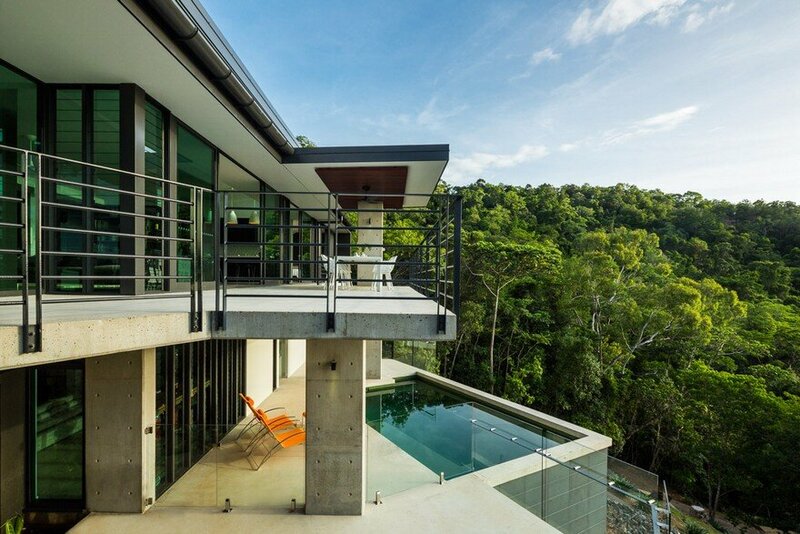 Hood Cliff Retreat seeks a similar relationship with the ground that feels both connected to and protected from the elements of nature. 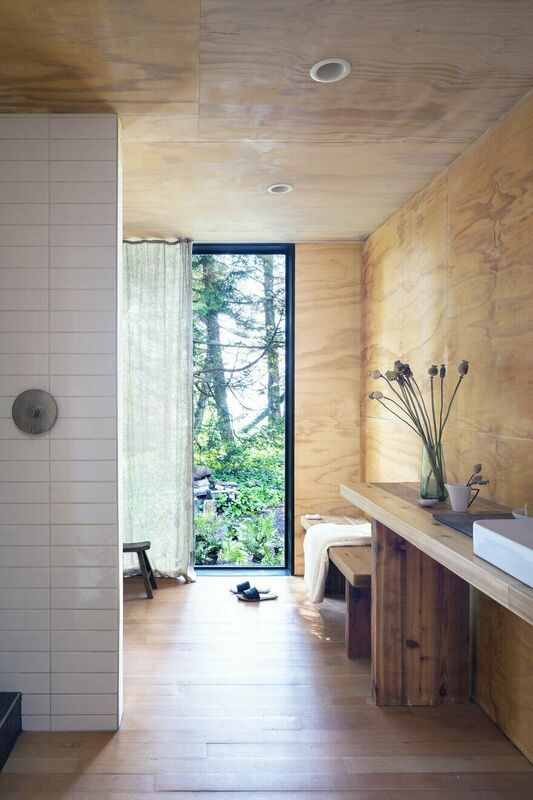 Reclaimed beams and siding from the original cabin were re-purposed as countertops and interior cladding. 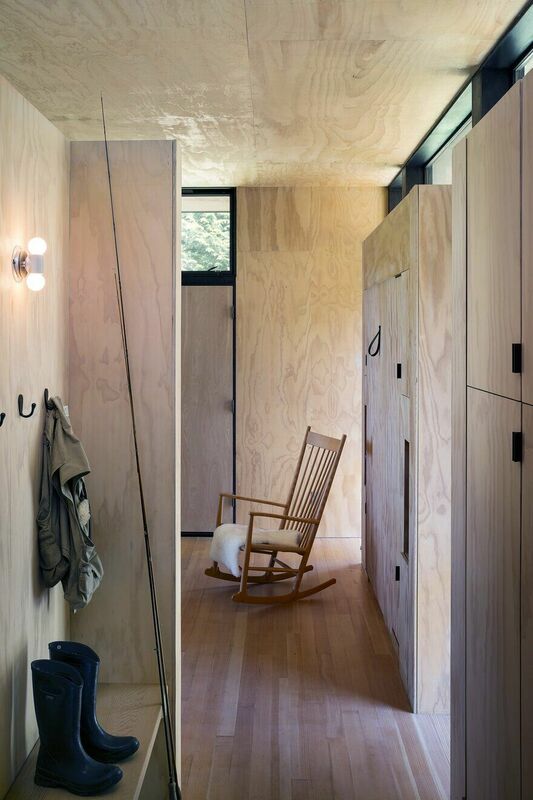 Simple details and a restrained material palette kept the construction budget to a minimum. 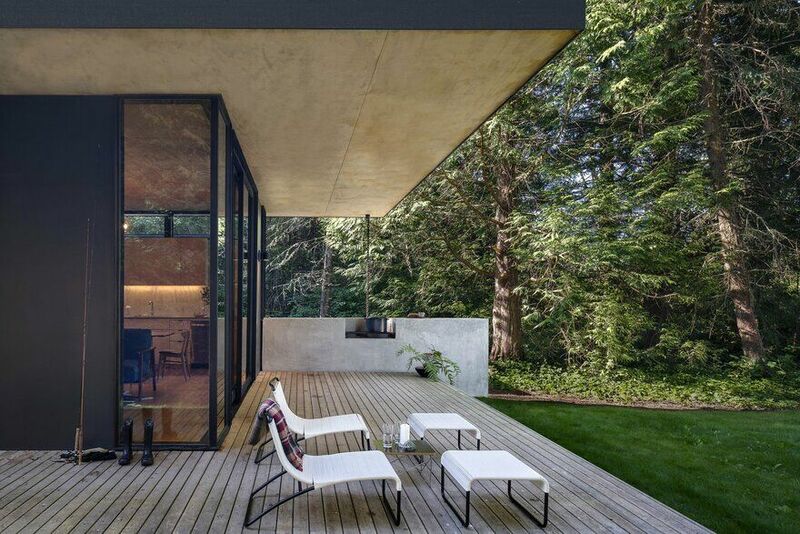 “We sought to dissolve the barriers between the inside and out, between forest, garden, and structure,” says Wittman. 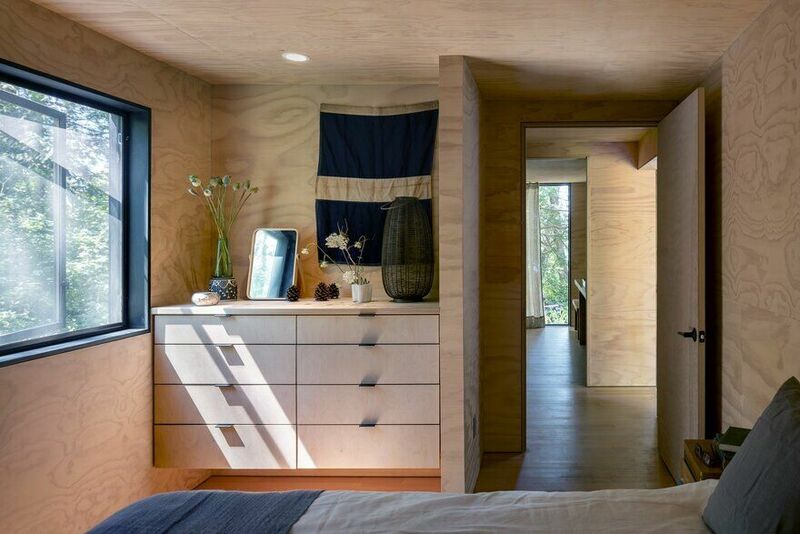 Sunlight warms the plywood walls and ceilings, grazing the warm cedar boards and cast-in-place concrete – allowing shadow and light to transform the simple interior into something more complex and subtle. 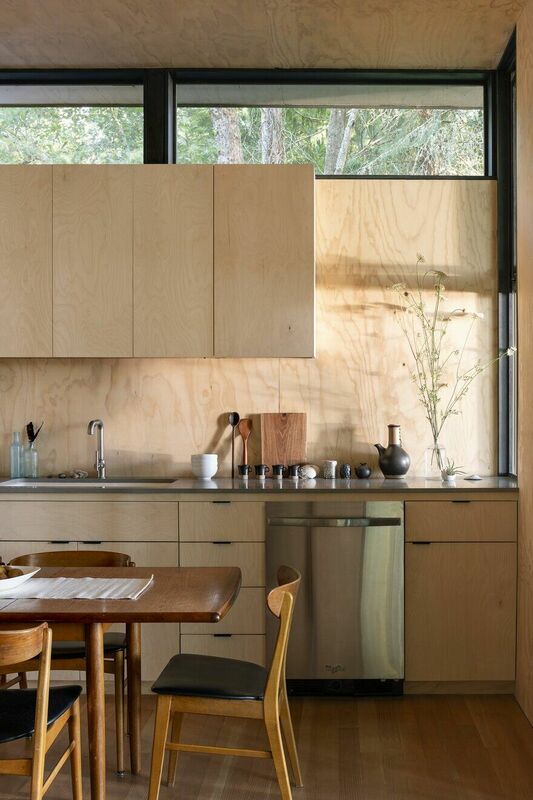 In the main cabin, the indoor outdoor kitchen has a pass-through window that extends the interior countertop into the outdoor concrete counter and built in wood barbeque. 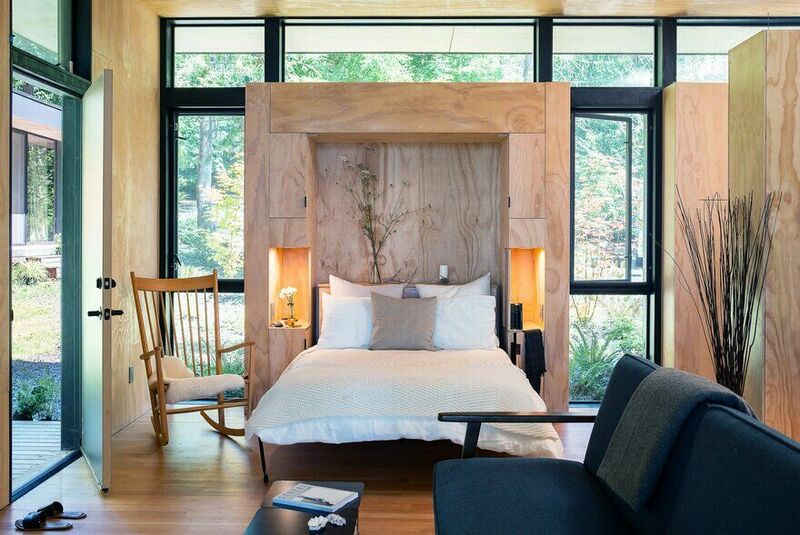 There is a built-in Murphy bed that allows the main cabin to be a flexible sleeping area when needed. 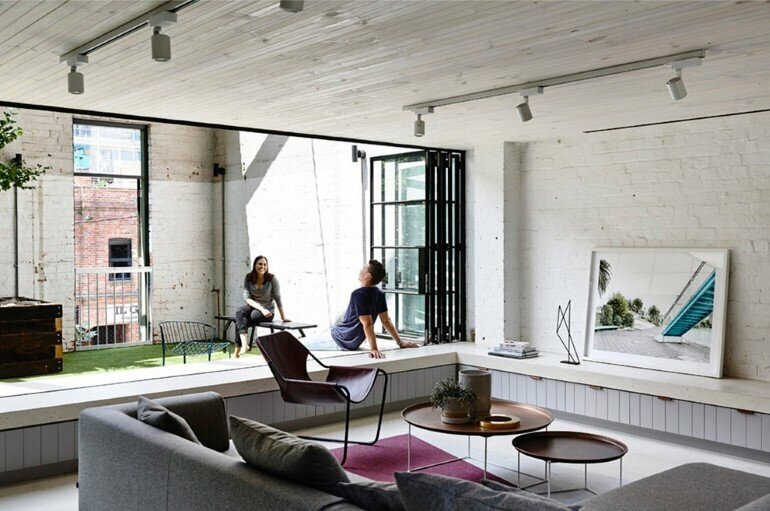 High clerestory windows allow views outdoors and natural light inside. 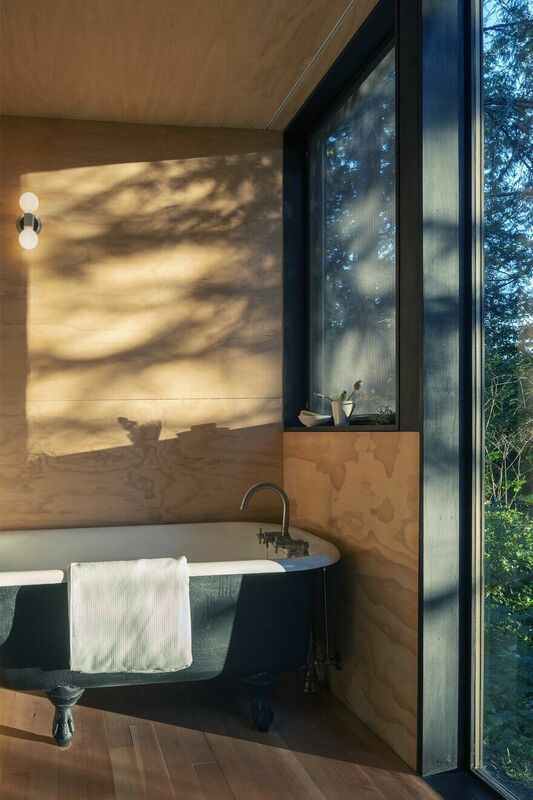 A reclaimed cast iron tub in the master bath creates the feeling of soaking in the outdoors without interrupting moments of repose. 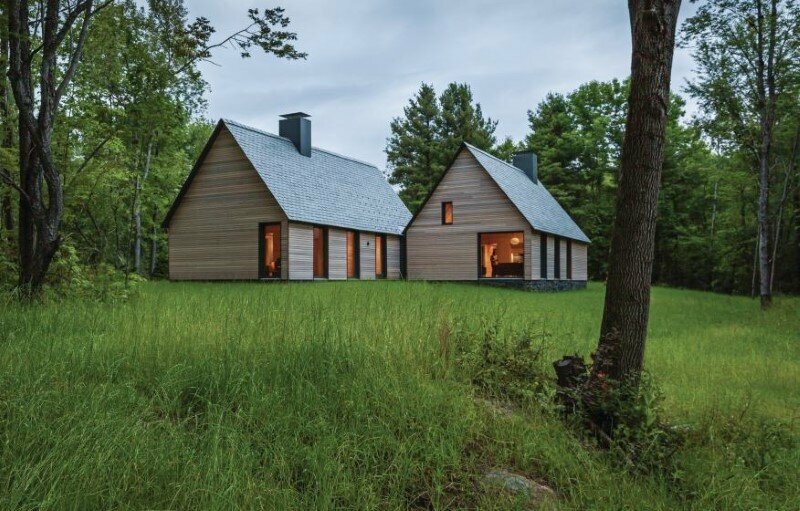 Outside, the rough sawn cedar siding and cement panel finishes patina naturally over time until the cabin volumes converge with the colors of the forest. 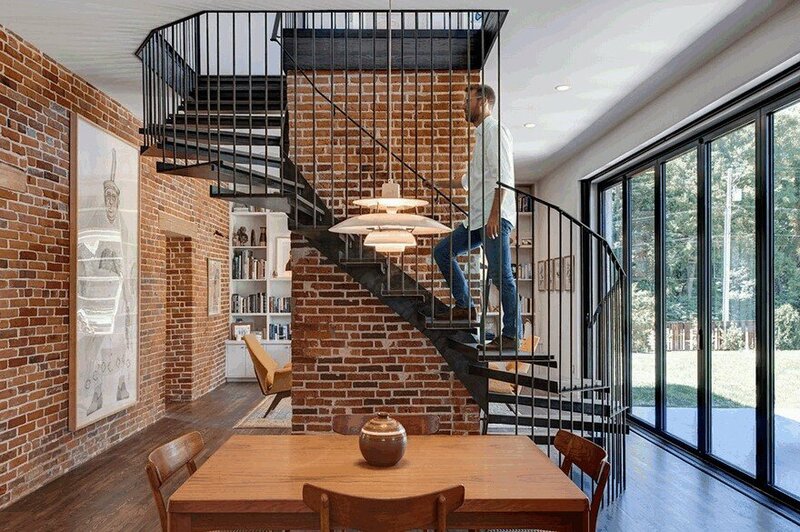 This inside- outside connection is how the architects approach building sensitively in nature. 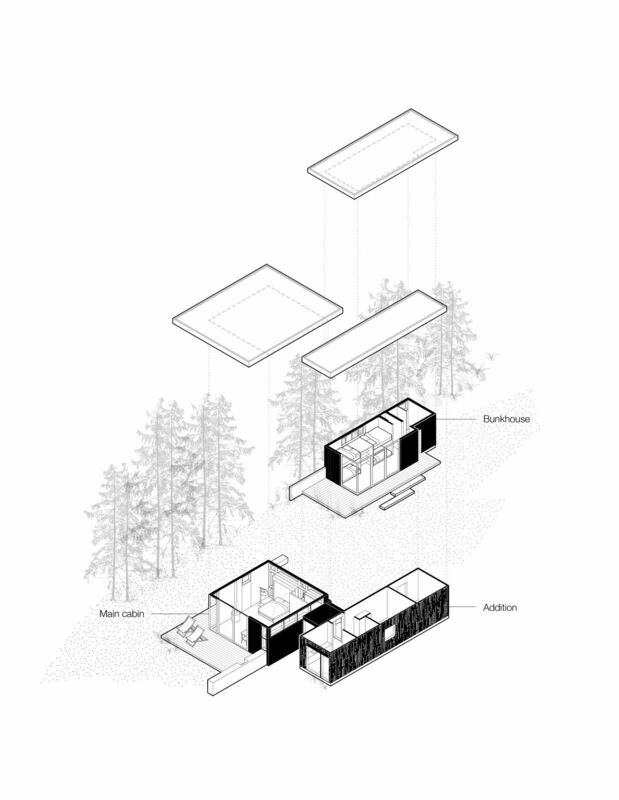 The three dwelling structures are a continuous interconnected series of experiences composed to celebrate the beauty of family gathering in natural sunlight and fresh air. 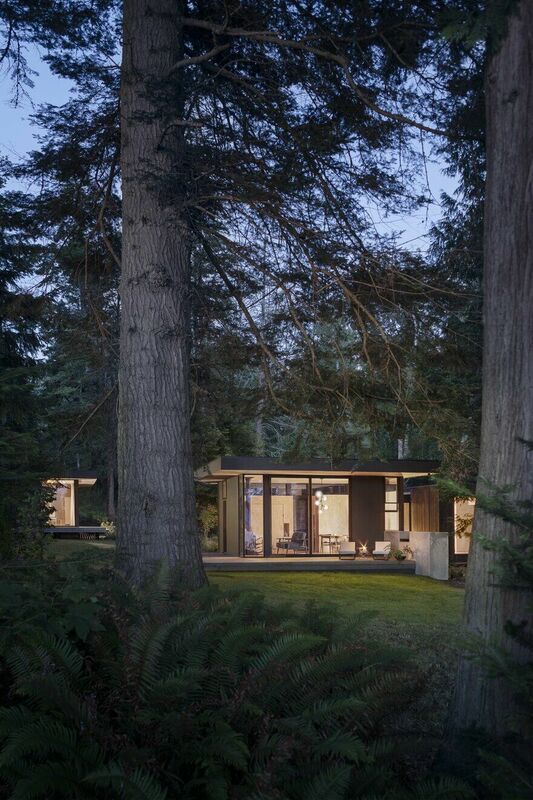 The Hood Cliff Retreat is an expression of Wittman Estes’ “tactile modernism,” connecting the family to the sensation and physical experiences of the Puget sound ecosystem in a place that is beautiful, functional, and built for the sustainable long term enjoyment of the nature loving Troth family.